A mother zebra with a foal in Tanzania’s Tarangire National Park. ​One of nature’s fascinating questions is how zebras got their stripes. 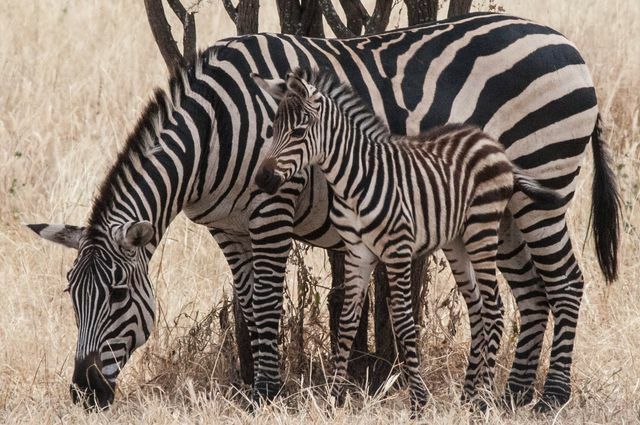 A team of life scientists led by UCLA’s Brenda Larison has found at least part of the answer: The amount and intensity of striping can be best predicted by the temperature of the environment in which zebras live. In the January cover story of the Royal Society’s online journal, Open Science, the researchers make the case that the association between striping and temperature likely points to multiple benefits — including controlling zebras’ body temperature and protecting them from diseases carried by biting flies. 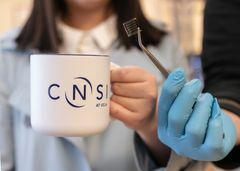 “While past studies have typically focused their search for single mechanisms, we illustrate in this study how the cause of this extraordinary phenomenon is actually likely much more complex than previously appreciated, with temperature playing an important role,” said Thomas B. Smith, professor of ecology and evolutionary biology in the UCLA College and senior author of the research. Larison, a researcher in UCLA’s department of ecology and evolutionary biology and the study’s lead author, and her colleagues examined the plains zebra, which is the most common of three zebra species and has a wide variety of stripe patterns. On zebras in warmer climes, the stripes are bold and cover the entire body. On others — particularly those in regions with colder winters such as South Africa and Namibia — the stripes are fewer in number and are lighter and narrower. In some cases, the legs or other body parts have virtually no striping. Zebras evolved from horses more than 2 million years ago, biologists have found. Scientists have previously hypothesized that zebras’ stripes evolved for one, or a combination of, four main reasons: confusing predators, protecting against disease-carrying insects, controlling body temperature and social cohesion. And while numerous previous studies of the phenomenon focused on a single hypothesis, the Larison-led study was the first to fully test a large set of hypotheses against one another. Analyzing zebras at 16 locations in Africa and considering more two dozen environmental factors, the researchers found that temperature was the strongest predictor of zebras’ striping. The finding provides the first evidence that controlling body temperature, or thermoregulation, is the main reason for the stripes and the patterns they form. 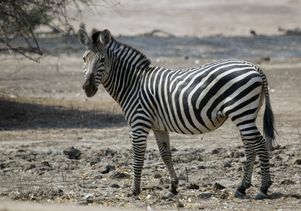 Separate research by Daniel Rubenstein, a Princeton University professor of ecology and evolutionary biology and a co-author of the Open Science paper, and Princeton undergraduate Damaris Iriondo strongly suggests that boldly striped zebras have external body temperatures about five degrees Fahrenheit cooler than other animals of the same size — like antelopes — that do not have stripes but live in the same areas. The Rubenstein study is not yet published, but it is cited in the Open Science paper. Larison has studied many zebras during her field work throughout Africa — including in Kenya, South Africa, Tanzania, Uganda and Zimbabwe. Using the fact that their stripes are unique like fingerprints, she is able to distinguish one zebra from another. In addition to Rubenstein, arguably the world’s leading expert on zebras, the study’s co-authors were Alec Chan-Golston and Elizabeth Li, former UCLA undergraduates in mathematics; Ryan Harrigan, an assistant adjunct professor in UCLA’s Center for Tropical Research; and Henri Thomassen, a former UCLA postdoctoral scholar and current research associate at the Institute for Evolution and Ecology at Germany’s University of Tübingen. 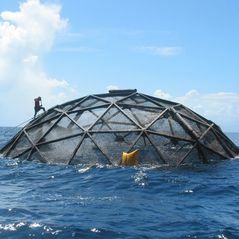 The research was supported by the National Geographic Society Committee for Research and Exploration. Larison and her research team have also collected zebra tissue samples and have used cutting-edge technology to sequence zebra DNA to try to identify which genes code for striping. The team is continuing to study the benefits stripes provide. 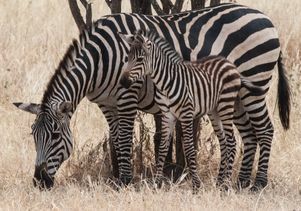 A mother zebra with a foal in Tanzania's Tarangire National Park.